CMHA Heritage View Community Center [7230 Kinsman Road] – serving youth in the Central-Kinsman neighborhood through a partnership with Cleveland Metropolitan Housing Authority; Mondays and Thursdays, 4-6 p.m.
Family Ministry Center [3389 Fulton Avenue] – serving youth in the Clark-Fulton neighborhood; Wednesdays and Fridays, 5-7 p.m. Boys & Girls Club at St. Luke’s Manor [2705 Martin Luther King Jr. Drive] – serving youth in the Buckeye neighborhood; Mondays and Wednesdays, 5-6:15 p.m. The Dance Academy at Tri-C is quickly becoming a premier center for dance education in Greater Cleveland. The academy’s renowned instructors have developed a unique and rigorous curriculum that trains students in the fundamentals of ballet and modern dance techniques and performance skills. Several students of the academy have been selected to attend prestigious dance companies with full scholarships. In a single year, the program’s enrollment grew by 400 percent, from 25 students in 2015 to 125 in 2016. The Cleveland Foundation grant will bring the total of youth served to 325. This grant is the latest in the Cleveland Foundation’s Mastery Arts Initiative, launched in 2016 to expand access to high-quality mastery arts programs for youth in low-income neighborhoods across Greater Cleveland. With today’s announcement, the foundation has now invested more than $1 million for youth access to artistic disciplines including theater, photography and music. Current partners include Cleveland Public Theatre and its successful Brick City Theatre program, which serves youth in Cuyahoga Metropolitan Housing Authority estates, and its Student Theatre Enrichment Program (STEP) serving at-risk teens; and Cleveland Print Room for “Multiple Exposure,” a pilot year-round mastery program in photography for students in low-income Cleveland neighborhoods. The foundation plans to help nearly 5,000 students access mastery-based arts programs as the initiative expands in future years. About the Cleveland Foundation: Established in 1914, the Cleveland Foundation is the world’s first community foundation and one of the largest today, with assets of $2.1 billion and 2016 grants of $93.6 million. Through the generosity of donors, the foundation improves the lives of residents of Cuyahoga, Lake and Geauga counties by building community endowment, addressing needs through grantmaking, and providing leadership on vital issues. The foundation tackles the community’s priority areas – education and youth development, neighborhoods, health and human services, arts and culture, economic development and purposeful aging – and responds to the community’s needs. About the Tri-C Dance Academy: The Cuyahoga Community College Dance Academy teaches the fundamentals of ballet and explores creativity through modern dance and improvisation. 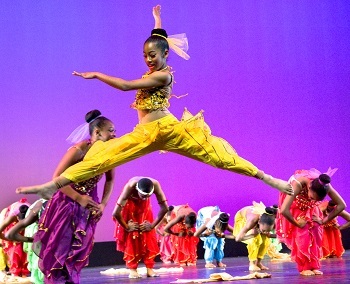 Students develop physical coordination, strength, flexibility, alignment and musicality through the study of tap, ballet and modern dance techniques. In addition they learn about etiquette and personal responsibility, and develop healthy self-esteem and strong peer relationships. Mastery-based instruction in technique, choreography, composition skills and performance development, culminates in a final performance.